Our dilemma is this. We have too much space! We have a large several acre area around our home, and our problem is that it is difficult to determine how much to do and where to start with landscaping for this country yard. I grew up on a city lot with definitive boundaries, so I'm feeling overwhelmed. I'd like to try and get a handle on it this summer. We have some good ideas that we'd like to try such as adding a pond of the west side as well as a garden railroad. We are trying to compartmentalize the different sections so we don't get overwhelmed. 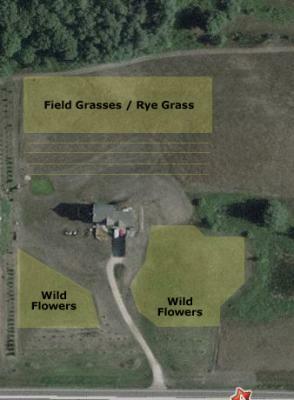 We also converted about three acres into prairie grasses and wildflowers to reduce maintenance and increase wildlife. My main question is, what is normally the best place to start when dealing with an oversized project? Near the home or other focal point such as drive, pond, retaining walls, etc.? I assume it's best to focus on one specific area and not work on too many areas at once. Thanks in advance for any advice at all. The aerial photograph shows a few of the details that I mention. On the top/north side of the property, my father-in-law always plants rye grass. Last year I planted 150 pine and spruce trees. They were bare root and are represented by the yellow lines. On the west or left side next to the home, we have a sunken patio surrounded by a boulder wall. This is hidden by the large shadow. On the bottom or south side, you can see the area of wild flowers as well as the many spruce trees that look like "dots." The east side is very similar as well. The driveway currently has a teardrop turnaround. I may replace it with a straight shot. What a large undertaking for you! Your best bet would be to hire a landscape designer to create at least a schematic design for you. I can see where a site such as yours would be overwhelming, and this would help you to see a "picture" and give you a road map of where to go when and how. That being said, I will tell you what my approach would be. I would look at your goals. For example, you mentioned a pond and a new driveway design as possibilities. Those are good places to start as far as placement and layout goes. If you have some other ideas, try to decide where the best locations would be. As you work with the desired elements of your landscape and place them, a picture will start forming. Once this is done, you move forward to details. Work from large concept/area ideas to the smaller and more intricate, such as specific plant materials or paving materials. Make sure you think about access. Having wildflower areas is an attractive and functional idea, although there will be some maintenance. Large spaces should have some planned plant coverage on them, whether it be woods, lawn, groundcover, wildflowers/meadows, etc. If you decide you would like to go the more professional route and would like to discuss it, let me know.